Leaguers, every year in late December or early January, better bloggers and publications than The League publish an end of the year re-cap of the year's entertainment, news, deaths, etc... It's usually done up in a "top five" or "top ten" list of the year. Or else just a "single best of the year" award for multiple categories. Others publish stories on how stupid these lists are. Others publish relatiatory articles saying "nuh uh! It ain't stupid!" Too which, the first guy says "Oh, yeah it is!" And it all ends in tears. The truth is, everyone does much better lists than I'd ever compile, and since we're slightly more than half-way done with 2004, let's see where we're at. The League is looking for submissions for "The 2004 Mellies." 2) No more than two selections per category per person. 3) Out of all entries, four will be selected for voting. 5) Nominating ends June 30th. 7) We must submit a minimum of one nomination per category, or you may not nominate at all. Special Randy Rule: You may not complain that you don't know. Make something up if you have to. 8) Try to stick to things which were released or occurred since January 1, 2004. Try not to project into the future for things you have not yet seen or experienced. 9) Any reasons for any nominations you give may see print. Be sure you want your first name associated with your opinion before you start dropping the f-bomb all over the place. 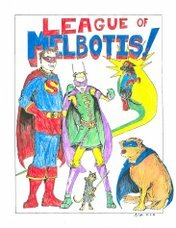 10) Worst blog topic at "League of Melbotis." 16) Which former POTUS (President of the United States) do you know least about, but want to know more? Sure, it's an unweildy list of categories, but I know you guys are up to it. Submit your nominations to me via e-mail. In early July, I'll post the voting and we can get cracking. Sadly, there are no prizes for anybody this go round. Prizes are a huge hassle.